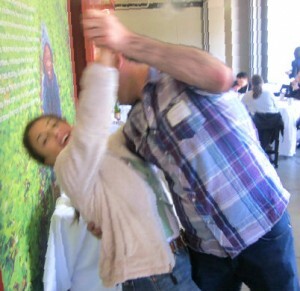 Parties That Cook has been hosting Mother’s Day brunch cooking classes in San Francisco for as long as I can remember.. or maybe more like 2010. Still, we have about 14 years of hands-on cooking party experience to bring to the table – literally. If you’re on the fence about what to do with your Mom this Mother’s Day, let this sample itinerary and visual stroll down memory lane help you decide on a cooking class! 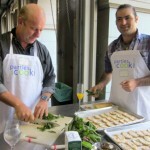 You can still join Parties That Cook for Mother’s Day brunch cooking class in San Francisco, or look for a similar option in a city near you. 10:30am – Arrive at the beautiful Ferry Building on the (hopefully) sunny Embarcadero. 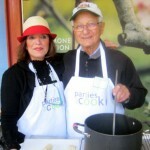 Look for the Parties That Cook sign, prepped cooking stations, and smiling PTC staff in chefs coats or purple aprons. Check in, fill out a fun name-tag and grab a white apron. 10:37am – Looking for something to sip on? Grab a cup of OJ or coffee while you chat with the other guests. Expect to see new Moms, “seasoned” Moms, Moms with their husbands, Moms with grown children, groups of Mom friends, and more. It’s like a Mommapalooza! 10:49am – Is your stomach starting to rumbling? Head over to one of the antipasti platters floating around. Nosh on the delicious assortment of cheese, crackers, and maybe some other fun surprises. Problem solved. Hunger vanquished. 11:00am – Notice your lead chef calling everyone together? Gather ’round one of the cooking stations prepped for successful recipe execution. If you’re lucky, Heather will be the chef leading guests through a few safety tips like how not to pass a knife to your new friends. Hint: do NOT throw. Heather, I mean your lead chef, will also go over a number of useful tips & tricks to help you conquer the morning’s recipes. Pay attention! Or just ask our helpful chefs to clarify later. They don’t bite. 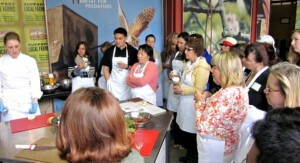 11:27am – Break into groups to tackle a couple recipes on the menu. Skip the flashbacks of middle school kickball team selection. You will not be separated from your Mom, fellow mom-friends, neighbor, or anyone you else came with. 11:35am – Steal away to grab another drink, this time a soda. Wash your hands. Yes, both of them! And get to cooking! 11:41am – Cook. Cook. Cook. Cook. 12:13pm – Remember you aren’t the only team cooking! Walk around and check out what other groups have going on. Don’t worry, you’ll be able to taste their yummy creations, too. Cook more. 12:24pm – Hijack Mom and start an impromptu dance party. Why not? 12:30pm – Ding! Your dishes are ready, and it’s time to feast. This year’s menu includes Bacon Wrapped Apricots with Blue Cheese (a favorite), Zucchini Pancakes with Smoked Trout (YUM. ), Chorizo and Potato Frittatta Bites (your new go-to brunch item), Crostini of Artichoke (you’ll want this in your party dish arsenal), and Brioche Bread Pudding (DECADENT!! must be said in Oprah voice). My mouth is watering already! 1:30pm – We know you’re full. Savor any remaining morsels you can before heading out to enjoy the rest of the gorgeous day with Mom. Or, you know, take a nap.. Either way, the PTC team will take care of any and all clean up – in true PTC fashion. All Day: Have a fabulous Mother’s Day! Spend time with loved ones, and maybe a few new friends. Update: For those in SF looking for a restaurant, look no further than Tablehopper’s round up of just about every dine-out option available! 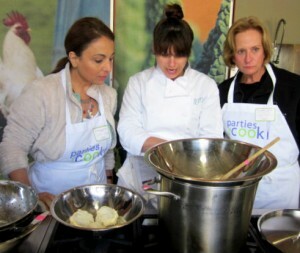 Are public cooking classes not your thing? 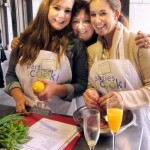 Consider booking a private cooking party! The Ferry Building is just ONE of our great venue partners – and we can even come into your home or office. You know you want to show off your kitchen skills, competitive nature, and maybe even your favorite apron to all your colleagues, and a Parties That Cook corporate team building event is the perfect place to do so!